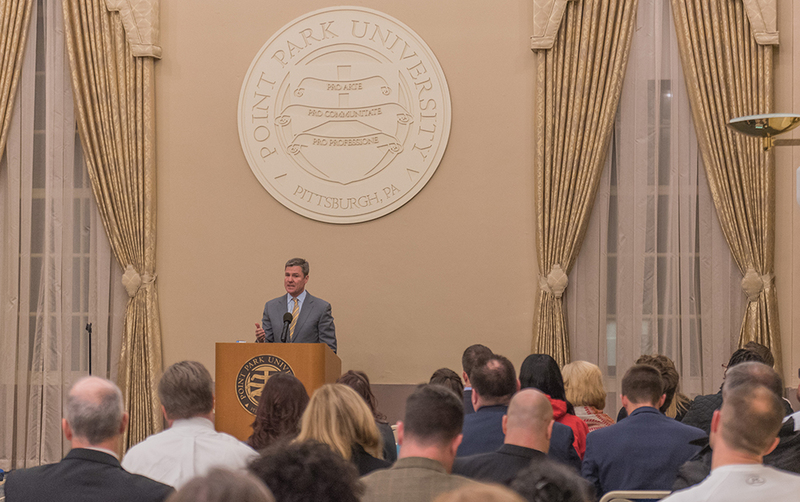 Frank Coonelly, president of the Pittsburgh Pirates, shared his leadership journey with the Point Park University community Jan. 17, as part of the Ed.D. in leadership and administration program’s new speaker series. "Mr. Coonelly presented key ideas of his organizational vision and the ways in which they match Pirates baseball to the community,” explained Eric Stennett, Ed.D., assistant professor of education and director of the Ed.D. in leadership and administration program. “His vision is an outstanding example of leadership in both challenging and good times,” Stennett added. “I learned that to be an impactful leader you must build trust internally with the people you lead and externally with the people you serve,” said Kristofer Stubbs, Ed.D. student and coordinator of Pittsburgh Public Schools Early College High School programs. Ed.D. student David Deramo, assistant superintendent of South Fayette Township School District, appreciated that Coonelly focused on the importance of establishing and maintaining a clear vision and purpose. “Mr. Coonelly emphasized the responsibility of a leader to be at the forefront of the organization during times of crisis or adversity as well as to make sure to give praise to employees and stakeholders during times of celebration and achievement,” Deramo said. Deramo hopes to continue to provide learning opportunities for students and teachers as a leader in the field of public education, while Stubbs’ career goal is to be the president of a college. “I believe through Point Park’s leadership and administration doctoral program I am being equipped with both the knowledge and skills needed to lead effectively,” Stubbs said. The Ed.D. 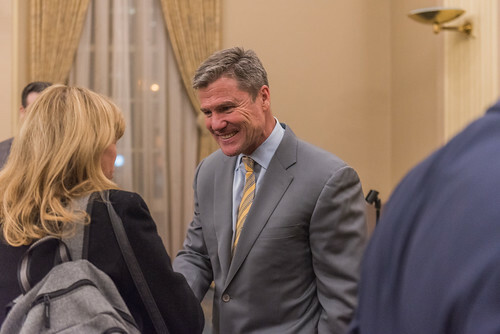 program, which is part of the University’s education department, plans to continue bringing in various types of leaders including CEOs, as well as nonprofit, education and sports leaders, to allow students to see the entire spectrum of leadership styles and theories. To kick off the Ed.D. speaker series this past fall, Pittsburgh Mayor Bill Peduto came to campus to discuss his leadership style and role in helping Pittsburgh become a resilient city.